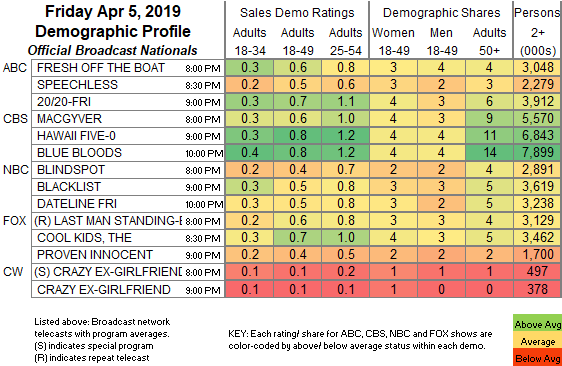 NETWORK FINALS: The CRAZY EX-GIRLFRIEND series finale and the entire NBC line-up (BLINDSPOT, THE BLACKLIST and DATELINE) dropped 0.1 in final numbers. CABLE HIGHLIGHTS: Cinemax’s WARRIOR had an inauspicious start, off the chart at 0.03/157K. A&E’s LIVE PD led Saturday cable, steady at 0.67, with the preceding clip show hour at 0.30. ESPN2’s NCAA WOMENS BASKETBALL TOURNAMENT games were at 0.41/0.24. ESPN’s NBA doubleheader WAS AT 0.39/0.38. 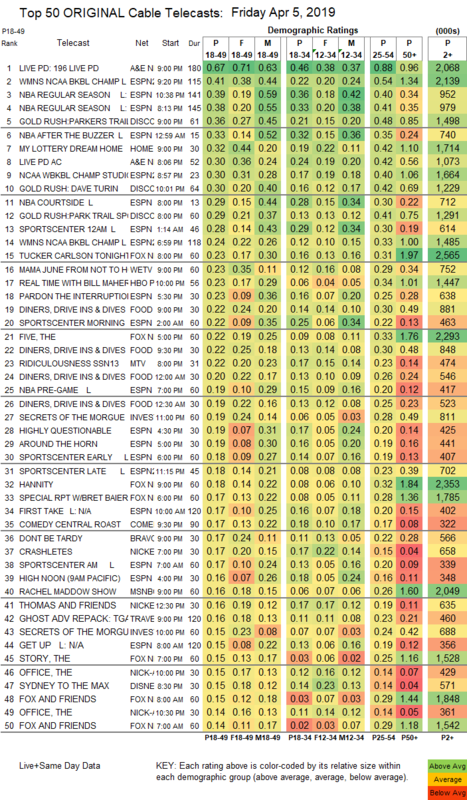 On Discovery, GOLD RUSH returned from a week off at 0.36, with the lead-out hour at 0.30, and the lead-in hour at 0.29. HGTV’s MY LOTTERY DREAM HOME gained 0.04 to 0.32. Fox News’s TUCKER CARLSON TONIGHT led cable news at 0.23/0.31/2.7M, with MSNBC’s RACHEL MADDOW SHOW at 0.16/0.26/2M, and CNN’s SITUATION ROOM at 0.11/0.15/600K. On We, MAMA JUNE: FROM NOT TO HOT rose 0.03 to 0.23, and BRIDEZILLAS was up 0.02 to 0.11. HBO’s REAL TIME WITH BILL MAHER lost 0.04 to 0.23. Food Network’s DINERS, DRIVE-INS & DIVES shed 0.03 to 0.22. MTV’s RIDICULOUSNESS slipped 0.02 to 0.22. On ID, SECRETS OF THE MORGUE ticked up to 0.19. Bravo’s DON’T BE TARDY was down 0.02 to 0.17.